Ya Gotta Know When to Hold ‘Em….and When to Fold ‘Em | Chronicles of a "Mini-Pro"
I got on the Dark Mare (better known as Lee) today for our first ride since late December. In the ten years we have been together, this is the first time I have ever let her “rough out” for the winter. With our recent move and lifestyle change, though, allowing her some time for R/R seemed not just prudent but inevitable—what little tolerance I used to have for riding outside in the snow in sub zero temperatures wore off many years ago. But spring is just around the corner, and ride entries for CTR’s are starting to come available, so I decided the time had come to get Lee back under tack. All things considered, for a sensitive Thoroughbred mare who has had two months off…she was pretty well behaved. I had planned to just walk around our fields for about an hour or so, but at the forty-five minute mark, her entire demeanor changed. She became jiggy and more spooky, and I could tell that she was on the verge of one of her infamous meltdowns. Deciding that discretion was the better part of valor, we headed home. Lee and I out on the trails at the farm in late fall, 2015. I was surprised when I untacked to discover that even with just that short bit of walking around, Lee had gotten a little sweaty on her hamstrings and under the saddle area. I think her “unsettled” behavior was just her way of telling me that she was tired and it was time to stop for the day. Knowing this, I will now adjust the plan for our next few weeks, taking shorter walks, with the goal of gradually working back up to one hour. Being a true horseman requires that you be in tune with your horse and how they are feeling on a given day. During the summer I spent with Denny Emerson, he always reminded us that a rider cannot get on with an agenda, or be too earnest, because to do so usually meant that they rode without sensitivity or compassion for the horse which they were sitting on in the moment. While we were working to re-establish Anna’s confidence over fences that summer, there were many days where I would warm up and literally jump ten fences, then go off for a hack. It is far better to do too little in a work session than too much. The horse must always finish feeling like they have been successful. 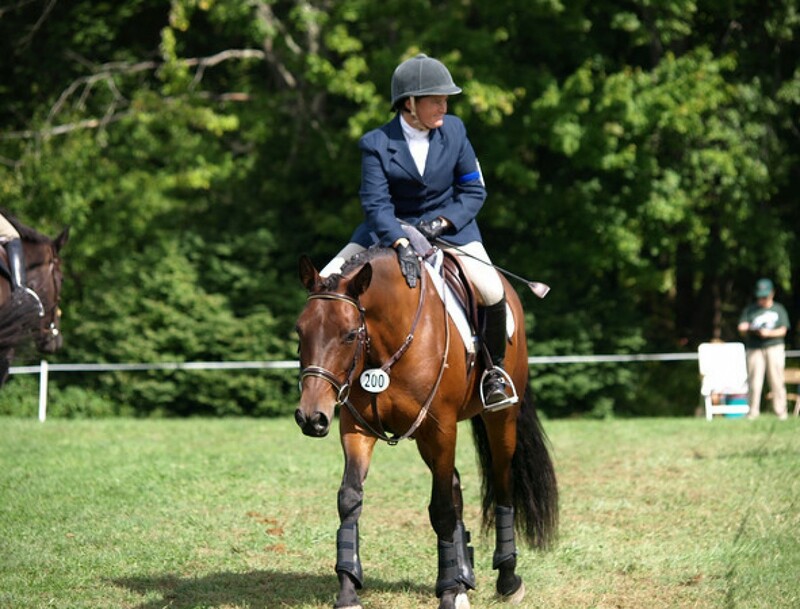 Anna and I schooling at Tamarack, summer of 2014. I hope that this statement would give most thinking horsemen cause for pause; we certainly have all been witness to situations in which Paillard’s words might ring true. But in my opinion, a rider who overworks their horse, or who drills, or who doesn’t learn to feel enough to quit the day’s work before the horse is too tired or exhausted to argue, is just as guilty of being inhumane as the one who overuses whips, spurs, bits or various artificial contraptions. We are only human, and the reality is that sometimes we are going to make mistakes, misread our horse or a situation, or react inappropriately. But the thinking horseman must recognize that they have erred and actively work to avoid doing so in the future. In the memorable words sung by Kenny Rogers (and written by the much less well known Don Schlitz): “If you’re gonna play the game, boy, you gotta learn to play it right. You’ve got to know when to hold ‘em, know when to fold ‘em, know when to walk away, and know when to run.” In horse training, the thinking horsemen must learn when to push (know when to hold ‘em), when to quit for the day (know when to fold ‘em), when to end on a good note (know when to walk away) and when to abandon a training approach which isn’t working (know when to run). Horse fitness is so rarely considered even though much (most) of what is termed misbehavior is actually tired hurting unfit horses trying to let their riders know. I’ve found Nyland’s translation and trails of Kikkuli’s 3500 year old principles of horse training eye-opening and useful.